Currently, the EU faces many crises at the same time: the refugee crisis, the Brexit, the economic crisis, ... Although the EU is constantly in the news, many people lack a clear overview of what the EU is and how it functions. In this training session, an expert of Ryckevelde freshens up the basic knowledge about the European Union: How and why did the European Union start? What does it do? And what does EU-membership of our countries mean to our own daily lives? 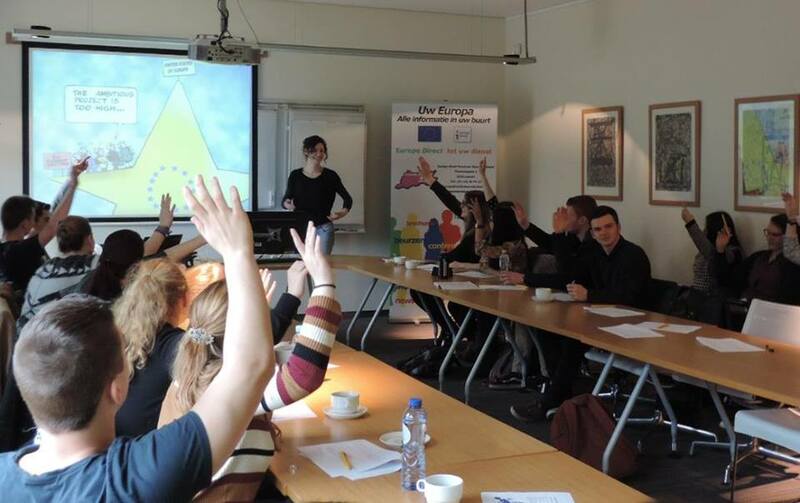 With the help of a visually attractive presentation, a Ryckevelde speaker guides your group through the different milestones of the European integration process, the European Institutions and current European issues. This training session offers an ideal helicopter view of the EU for both youngsters and adults. As organisor of the training, you look for a suitable location in Belgium. Our experienced speaker comes to your location. We need a room with a beamer and projection screen or white wall. Wifi connection is an asset. This training session is ideal for students from 17-24 years but can easily be adapted to an adult public. Please contact us to discuss the price and date: info@europahuis.be or +32 (0)50 35 27 20.